The Coding and Payment Guide for Laboratory Services is your one-stop coding, billing, and documentation guide to submitting claims with greater precision and efficiency. 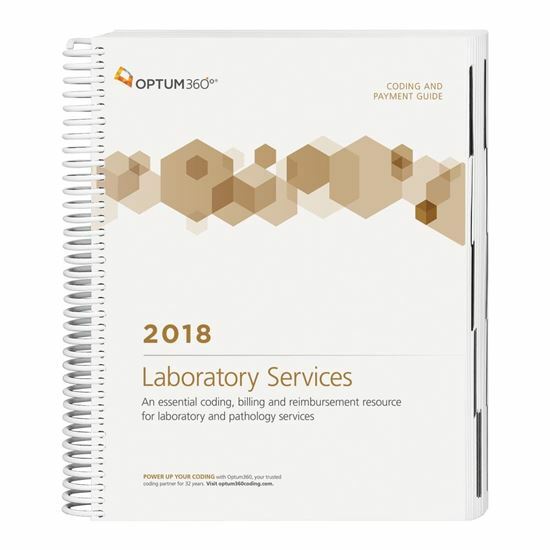 This guide has the latest laboratory and pathology-specific, 2018 CPT® and HCPCS procedure, ICD-10-CM and HCPCS Level II code sets along with Medicare payer information, CCI edits, helpful code descriptions, and clinical definitions. New — Code icons. Quickly identify new, revised and add-on procedure codes related to lab and pathology. Avoid confusion with easy-to-understand descriptions.Includes clear lay explanations of procedures represented by CPT® and HCPCS procedure codes. Prevent claim denials and stay up-to-date with Medicare payer information.Review Medicare Pub. 100 references containing information linked to HCPCS Level II and CPT® codes tailored to lab and pathology, to prepare cleaner claims before submission. Easily determine fees for your practice and reinforce consistency in the charges.Relative value units including the practice, work, and malpractice components with total RVUs for non-facility and facility for procedures and Medicare Clinical Laboratory Fee Schedule references are included.